The challenge to prove that electronic voting machines can be tampered with will start from June 3 in which political parties can use machines deployed in recently held assembly polls, but foreign experts have been barred from participating, the Election Commission announced on Saturday. The challenge would only be open to national and state parties which contested assembly polls in five states -- Uttar Pradesh, Uttarakhand, Manipur, Goa and Punjab -- and they would not be allowed to change the motherboard of EVMs and take the machines home to prove at a later date that they can be tampered with. The commission said with a changed chip, an EVM would no longer be the "ECI-EVM" but a lookalike. But the participants -- three members per party -- would be allowed to "physically examine" EVMs to check circuits, chips and the motherboard. They will be given four EVMs of their choice from assembly seats of the five states. 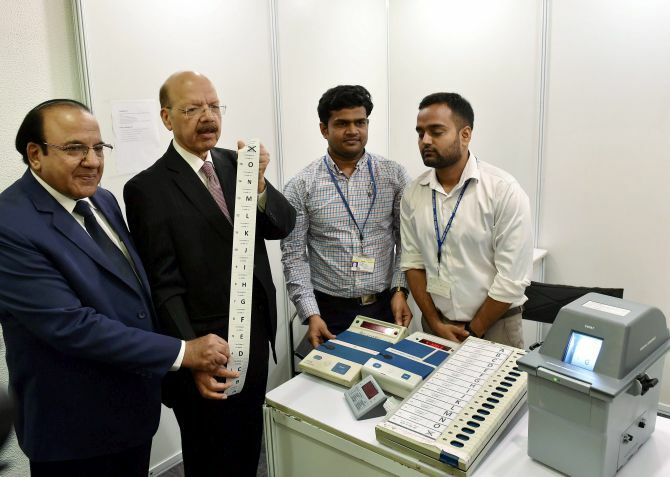 Asked whether he would take moral responsibility in case a machine is successfully hacked, Chief Election Commissioner Nasim Zaidi said it would be seen at that moment. He also said the event should not be seen as a "prestige issue" by anyone. The challenge would be judged by members of the Technical Expert Committee of the EC mainly to ensure that the rules are followed and the machines are not damaged. They are independent of the commission and do not charge anything for their service. Zaidi said the challenge could go on for "roughly" four to five days, depending on the number of participants. May 26 is the last date for applying for the event and letters of invitation would be out on Saturday itself. Each participating group will be given four hours to hack the machine. While in 2009, the challenge had taken place in Vigyan Bhawan, this time the venue is Nirvachan Sadan, the EC headquarters. Announcing the contours of the 'EVM challenge', Zaidi said it has been divided into two parts. Under the first part, the parties will have to prove that the EVMs used in the assembly elections in the five states were tampered with to favour a particular candidate or political party by altering the results stored in them. The claimants will have to alter the results in the control units used during these polls in exactly the same conditions in which EVMs remain under the technical and administrative safeguards of the EC after elections. They can use a combination of keys on EVMs or over the air communication devices such as cellphone and bluetooth to tamper with the machine to change the results, he said. Under part two of the challenge, the participants will have to prove that the EVMs used in the assembly polls were manipulated before or on the poll day. At their own cost, participants can accompany the chosen EVMs from the warehouses to the commission headquarters in New Delhi during transportation. The participant would be considered to have "failed" the challenge if the EVM stops functioning due its inbuilt anti-tampering mechanism. Also, the challenger would be considered to have failed if it showed the result of the booth where it was used during the assembly polls even after manipulation. Asked why foreign experts have been barred, Zaidi said while the EC respected them, but he would wants Indians to demonstrate that EVMs can be tampered with as the process relates to the Indian electoral system. Questions were also raised on reliability of EVMs and paper trail machines used in the Dhaulpur and Durg assembly bypolls. But the EC found that poll officials did not follow the procedures. The machines had no flaw. But the machines from the two constituencies are not part of the challenge as the period of 45 days under which an aggrieved party can move the high courts concerned is not yet over. Till the period is over, the machines cannot be withdrawn from the strong room as per law. Responding to a question, the CEC said people who had questioned the reliability of EVMs have not yet submitted any proof or credible material to support their claim. Several major opposition parties had claimed that the faith of people in the machines has eroded. The Bahujan Samaj Party and the Aam Aadmi Party had alleged that the machines used in the recent assembly elections were tampered with and favoured the Bharatiya Janata Party. Later, several other parties had joined the chorus and waned the EC to revert to paper ballots. The EC has already announced that it will ensure paper trail of voting in all future elections to the Lok Sabha and state legislative assemblies.